1. Put all ingredients into a mixing bowl. Note: Do not melt the coconut oil first. It will only whip up if it’s solid. Mix on high speed with a wire whisk or beaters for 10 minutes or until whipped into a light, airy consistency. 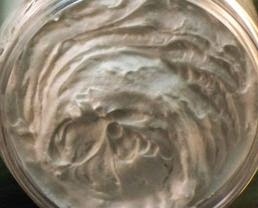 Spoon the whipped coconut oil body butter into a glass jar and cover tightly. Store at room temperature, or in the refrigerator if your house is so warm it melts the oil. 2. Note: Only use one of the optional choices or none of them. Whip longer if it seems to soft and keep in fridge if house is over 68 degrees.